correspond to the American edition of the text. Note: No translations of stories here; it's illegal!! Note to Mr. Abney's students: Don't spend much time on word searches. That's not a format we'll be using in class to test. 13. NEW: Check your comprehension of Latin grammar. 14. NEW: Practice singular and plural forms. 15. NEW: Practice translation of sentences 1. 16. NEW: Practice translaton of sentences 2. 17. NEW: Practice translation of sentences 3. 18. NEW: Practice translation of sentences 4. 19. NEW: Practice translation of sentences 5. 20. NEW: Check your knowledge of little words. 16. NEW: Practice singular and plural forms. 26. NEW: Take a nominative and accusative formation quiz. 27. NEW: Write sentences requiring nominative and accusative. 28. NEW: Take Mr. A's composition test: Write a story in Latin. 14. Take a multiple choice quiz over the story of Aeneas. 26. NEW: Practice the complementary infinitive with this online quiz. 27. NEW: Practice your listening comprehension skills with this audio multiple choice exercise. 28. NEW: Practice your listening comprehension skills with this audio matching exercise. 20. Check your understanding of noun-adjective agreement with this cloze practice. 16. Practice subjects and direct objects with a listening exercise. 17. Identify who greets whom in this listening activity. 18. NEW: Third Declension Plurals: Nominative or Accusative? 19. NEW: Tour a Roman Home Webquest. 20. NEW: Identify Features of the Roman Home. 1. Practice noun endings for 1st, 2nd, and 3rd declensions. 3. Practice more noun-adjective combos. Check out the forms of the irregular noun deus here. Review all vocabulary in chapters one through seven. Practice ten items at a time. 12. Practice present tense forms recognition 1. 11. Try Mr. A's divine picture flashcards. 12. NEW: Now practice the iconography of the gods. 13. NEW: Practice more divine iconography. 14. NEW: Practice even more iconography. 16. NEW: Take a myth quiz. 27. NEW: Go beyond the basics with a Mythquest. 16. Students and teachers, print off a handy "cheat" sheet of classroom phrases here. Find additional information on classroom Latin here. Physically create the present tense with these drag and drop exercises. 1. Form present tense: drag and drop 1. 2. Form present tense: drag and drop 2. 3. Form present tense: drag and drop 3. 4. Form present tense: drag and drop 4. 5. Form present tense: drag and drop 5. 6. Form present tense: drag and drop 6. 7. Form present tense: drag and drop 7. 8. Form present tense: drag and drop 8. 9. Form present tense: drag and drop 9. 10. Form present tense: drag and drop 10. 11. Form present tense: drag and drop 11. 12. Form present tense: drag and drop 12. 13. Form present tense: drag and drop 13. 14. Form present tense: drag and drop 14. 15. Practice present tense formation for all conjugations. 16. Take a present tense formation quiz with this PowerPoint presentation. 12. Match the vocabulary with the appropriate story picture. Check out the family tree of Romulus and Remus. Review all vocabulary in chapters eight through twelve. Practice ten items at a time. 11. Take a Ch. 13 practice quiz (by Mrs. Kessler). Get conceptual help here: vowels used in present and imperfect. Physically create imperfect forms with these new drag and drop exercises. 1. Form three imperfect forms: drag and drop 1. 2. Form three imperfect forms: drag and drop 2. 3. Form three imperfect forms: drag and drop 3. 4. Form three imperfect forms: drag and drop 4. 5. Form three imperfect forms: drag and drop 5. 6. Form three imperfect forms: drag and drop 6. 7. Form three imperfect forms: drag and drop 7. 8. Form three imperfect forms: drag and drop 8. 9. Form three imperfect forms: drag and drop 9. 10. Form three imperfect forms: drag and drop 10. 11. Form three imperfect forms: drag and drop 11. 12. Form three imperfect forms: drag and drop 12. 13. Form three imperfect forms: drag and drop 13. Now put it together here. 14. Conjugate a verb from each conjugation in imperfect. Work with irregular verbs sum and possum. 17. Practice conjugating sum in imperfect. Find the forms of the irregular noun bôs here. 15. Practice noun-adjective agreement again: multiple choice 1. 16. Practice noun-adjective agreement again: multiple choice 2. 17. Practice noun-adjective agreement again: multiple choice 3. 18. Take Mr. A's noun-adjective quiz 1. 19. Take Mr. A's noun-adjective quiz 2. 20. Take Mr. A's noun-adjective quiz 3. 13. Practice conjugating the irregular verbs in present and imperfect tenses. 1. Review singular noun-adjective agreement only : the "eleventh" quiz. 3. Review noun-adjective agreement: quiz 6. 5. Review imperfect formation: same quiz as in #4 without the principal parts. 6. Review imperfect formation: quiz with principal parts. 7. Review imperfect formation: same quiz as in #6 without the principal parts. 8. Review imperfect formation: quiz with principal parts. 9. Review imperfect formation: same quiz as in #8 without the principal parts. Review all vocabulary in chapters thirteen through seventeen. Practice ten items at a time. 12. Practice all the third declension adjectives: complete the table. 13. Complete the noun-adjective chart 1. 14. Complete the noun-adjective chart 2. 15. Take Mr. A's third declension adjective quiz 1. 16. Take Mr. A's third declension adjective quiz 2. 17. Are you up to the challenge: take Mr. A's all adjective types quiz if you dare. Principal parts of every verb in the book online below. Click here. Common indicators of perfect tense: print it off as a handy reference. Practice principal parts and perfect tense online. You may ignore macrons if you wish. 9. Take a practice "Blue Quiz." 9. Take a practice "Orange Quiz." 9. Take a practice "Green Quiz." 8. Take a practice "Purple Quiz." 9. Take a practice "Red Quiz." Now quiz yourself on perfect tense formation. 6. Translate into Latin perfect tense according to the cues: quiz 1 with the principal parts. 7. Same as quiz in #6 but without the principal parts. 8. Translate into Latin perfect tense according to the cues: quiz 2 with the principal parts. 9. Same as quiz in #8 but without the principal parts. Review all vocabulary in chapters eighteen through twenty-one. Practice ten items at a time. 24. Practice future tense of the main irregular verbs. 35. NEW: Do a mini-webquest on Roman aqueducts. Get conceptual help for the future tense of every kind of verb (will open in new window). 1. Form four future tense verbs: drag and drop 1. 2. Form four future tense verbs: drag and drop 2. 3. Form four future tense verbs: drag and drop 3. 4. Form four future tense verbs: drag and drop 4. 5. Form four future tense verbs: drag and drop 5. 6. Form four future tense verbs: drag and drop 6. 7. Present or Future: Contrast 2nd and 3rd conjugations. 8. Choose the correct translation. 9. Take a future tense formation quiz (easier version). 10. Take the same quiz as in #9 but without the principal parts. 14. Choose the correct translation: pluperfect or future perfect? 15. Take a tense formation quiz for pluperfect and future perfect (easier version). 16. Take the same quiz as in #15 but without the principal parts. Review all vocabulary in chapters twenty-two through twenty-four. Practice ten items at a time. 24. Practice 4th declension nouns impetus (attack) and manus. 25. Practice 5th declension endings diês and rês. 21. Practice the forms of the demonstrative hic. 22. Practice the forms of the demonstrative ille. 23. Choose the correct form of hic/ille multiple choice. 12. Practice forms of the personal pronoun/demonstrative is, ea, id here. 13. Take another demonstrative quiz. 14. Practice just is, ea, id in this quiz. 16. Take a pronoun and possessive quiz. Review all vocabulary in chapters twenty-five through twenty-seven. Practice ten items at a time. 1. Practice present tense for all four conjugations. 2. 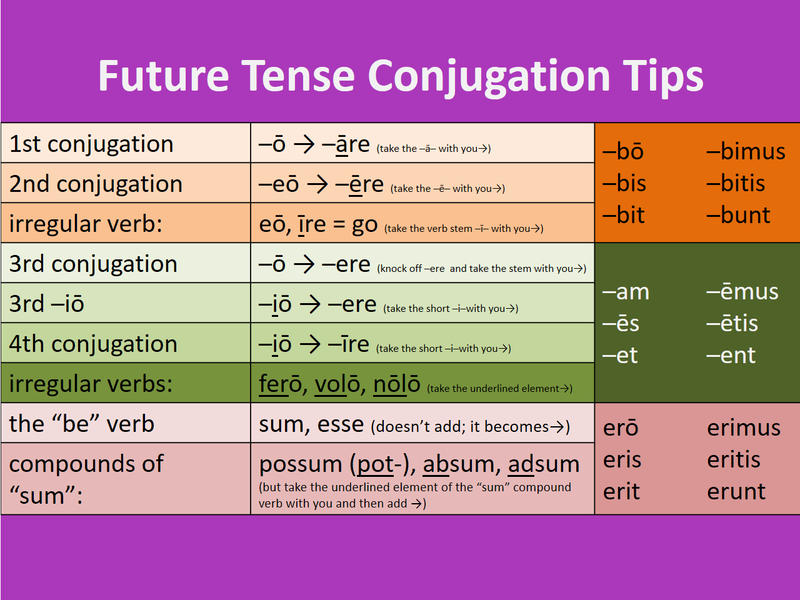 Practice future tense for all four conjugations. 3. Practice imperfect tense for all four conjugations. 4. Practice perfect tense for all four conjugations. 5. Practice pluperfect tense for all four conjugations. 6. Practice future perfect tense for all four conjugations. 7. Take Mr. A's Verb Tense Quiz. 8. Check principal parts for 32 of the most common verbs in the Aeneid. Check basic noun endings here: my Noun Page. 9. Practice the 1st declension noun puella. 10. Practice the 2nd declension masculine nouns hortus. 11. Practice the 2nd declension neuter noun baculum. 12. Practice the 3rd declension nouns aestās. 13. Practice the 3rd declension neuter noun corpus. 14. Check genders of random 3rd declension nouns 1. 15. Check genders of random 3rd declension nouns 2. 16. Check genders of random 3rd declension nouns 3. 17. Practice the 4th declension nouns arcus. 18. Practice the 4th declension neuter nouns cornū (horn). 19. Practice the 5th declension nouns diēs and rēs. 20. Test your knowledge of basic noun grammar. NEW: Practice ALL VOCABULARY from the book, ten items at at time! May take a second to load. Here are other reliable links not by Mr. A. Check out the new Prentice Hall Ecce Romani I practices. Flash Player to be able to do many of these interactive exercises. Nota bene: If you are not one of Mr. Abney's students, you need to know that many of these exercises use the special characters â, ê, î, ô, û to stand for the macrons (long marks) in the textbook. If you do not choose the vowels with macrons where appropriate, your answer will NOT register as correct. Thanks for visiting. Back to the Top. Back to Main Index. Back to Main Classics Page. Note to visitors: Technically, imperfect tense in Latin has only two vowels, -a- and -e-. The -i- in 3rd -io and 4th conjugation verbs is actually a part of the stem. However, to make memorizing the rules easier, I have grouped the imperfect vowels as follows. Consult your instructor for his/her preferences. Back to top. Back to Imperfect Section. Click on Mt. Vesuvius for the Latin I general welcome. for the Latin I handout.